General McMaster — who has called the appointment a "privilege" — follows the departure of the embattled Michael Flynn who resigned from the position after reports he misled the White House about his contacts with Russian officials. In 1997, General McMaster rose to prominence after writing the book Dereliction of Duty, which criticised the country's military and political leadership for poor leadership during the Vietnam War. The book maintained that senior officers should have challenged former president Lyndon B Johnson's and defence secretary Robert McNamara's lack of a strategy to handle the Viet Cong and North Vietnamese Army. Despite its iconoclastic nature, Dereliction of Duty remains highly influential in the US military community and is suggested reading for the Marine Corps and Pentagon. Despite his renowned reputation as a top officer in the Iraq War, General McMaster was twice passed over for promotion to Brigadier General in 2006 and 2007. No official reasoning was given for passing over General McMaster, but it was generally accepted within the military community that his iconoclasm and questioning of the status quo cost him the role. General McMaster was eventually promoted to the position in 2008 — by General David Petraeus, who took himself off the list last week for national security adviser — but his iconoclastic nature has remained a significant point of consideration. General McMaster's Dereliction of Duty book began as part of a PhD thesis in American history at the University of North Carolina. As a student of the US military, he has often maintained that despite immense technological advancements, the human aspects of war remain and are unavoidable on the field. In the same interview, General McMaster also maintained that despite his forward-thinking approach, his understanding of the history of the military continued to remain a huge influence on how he makes future decisions. General McMaster posited early on that a lack of planning for a sustainable political outcome in both Iraq and Afghanistan was a failure that unnecessarily complicated both of those wars. In 2014 General McMaster made Time Magazine's list of the 100 most influential people in the world. In an accompanying piece written by Lieutenant General Dave Barno, who commanded US forces in Afghanistan, General McMaster is hailed as "the architect of the future US Army". General McMaster's feature on Time's 2014 list followed years of recognition in Iraq as "one of the most celebrated soldiers" and appraisal as an "unconventional" yet "impressive" military officer. In Iraq, General McMaster's approaches to battles were considered legendary. Months after featuring in Time Magazine's list, General McMaster was officially promoted to Lieutenant General. President Donald Trump announced Monday that Lt. Gen. H.R. McMaster will serve as his next national security adviser, filling the void left last week by the sudden dismissal of Michael Flynn. McMaster, the head of the Army Capabilities Integration Center, will become one of Trump's top national security and foreign policy advisers, taking the helm of the White House's National Security Council, which was left rudderless after Flynn was forced to resign after just 24 days on the job. Retired Lt. Gen. Keith Kellogg, who had been serving as the acting national security adviser since Flynn's exit, will return to his role as chief of staff of the National Security Council. "He is a man of tremendous talent and tremendous experience," Trump said of McMaster. "I watched and read a lot over the last two days. He is highly respected by everybody in the military, and we're very honored to have him." McMaster called the appointment a privilege and said he looks forward to doing "everything I can to advance and protect the interests of the American people." McMaster was not Trump's first choice to assume the role of national security adviser. Trump initially offered the position last week to retired Vice Adm. Robert Harward, who turned it down amid concerns about how the White House was being run, sources told CNN last week. The search for a new national security adviser was sparked by a report that revealed Flynn had discussed sanctions with Russia's ambassador to the US, Sergei Kislyak, before the Trump administration came into office and did not disclose that detail of the conversation to Vice President Mike Pence. Trump said he fired Flynn because of his failure to disclose those details to Pence, but not because of the conversation itself with the Russian ambassador. 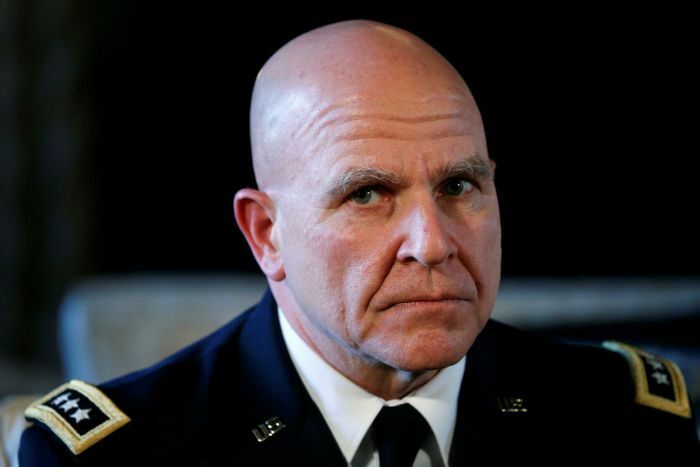 McMaster will take on the role after having served several tours of duty in Germany, Southwest Asia and Iraq, including a stint as special assistant to Gen. David Petraeus when he was commander of the US-led coalition forces in Iraq during the 2007 troop surge. McMaster has a PhD in military history from the University of North Carolina at Chapel Hill. He was tapped for national security adviser over several other finalists for the position, including John Bolton, the hawkish ambassador to the United Nations under George W. Bush who also served in senior positions in the administrations of George H.W. Bush and Ronald Reagan. Trump signaled Monday that Bolton would soon get a role in his administration "in a somewhat different capacity" despite having been passed over for the national security adviser spot. The President noted that Bolton has "a good number of ideas that, I must tell you, I agree with." Trump's pick earned quick praise from a contingent of Republican foreign policy leaders in Congress. California Rep. Devin Nunes, chairman of the House Select Committee on Intelligence, called McMaster "a fine addition" to Trump's national security team and pointed in particular to McMaster's "history of questioning the status quo and infusing fresh thinking and new approaches into military affairs." Sen. John McCain, the Armed Services Committee chairman who has been among Trump's chief Republican critics on Capitol Hill, called McMaster "an outstanding choice." "I have had the honor of knowing him for many years, and he is a man of genuine intellect, character, and ability," the Arizona senator said in a statement. "He knows how to succeed. I give President Trump great credit for this decision, as well as his national security cabinet choices. I could not imagine a better, more capable national security team than the one we have right now." 0 Response to "Trump Chooses H.R. McMaster as National Security Adviser"